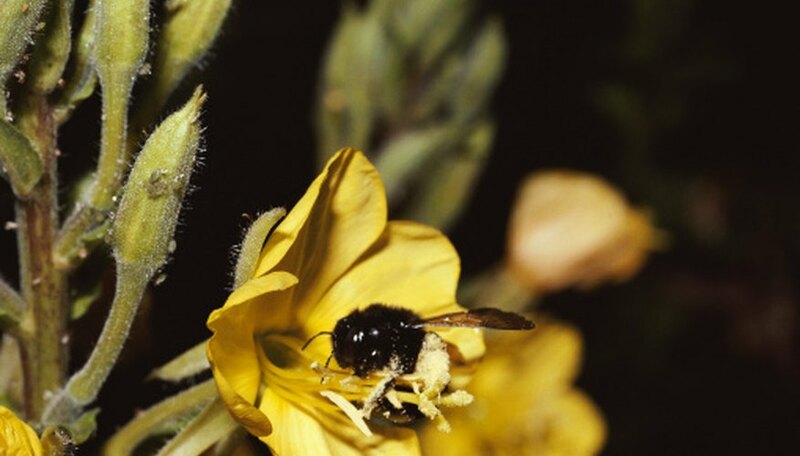 While carpenter bees are sometimes confused with bumble bees, carpenter bees rarely sting. Male carpenter bees have no stinger and female carpenter bees only sting when their nest is in danger. However, carpenter bees do cause damage to homes by boring into wood and laying eggs. Luckily, there are several natural repellents that effectively deter carpenter bees. There are several oils you can blend together into a natural repellent for carpenter bees, in addition to other types of bees, wasps and insects. Mix together 1/2 ounce of citronella oil, 1/4 ounce of lavender oil and 1/8 ounce each of pennyroyal oil, jojoba oil and tea tree oils. Mix the oils with 16 ounces of plain vodka and pour the mixture into a small spray bottle. Spray areas of your home or garden where you would like to repel carpenter bees. Be careful when spraying around carpenter bees nests, however, because female carpenter bees will sting if they feel their nest is threatened. Though carpenter bees rarely attack or sting, you may want to make a natural repellent that you can use on your skin, especially if you are allergic to bee stings. Make the spray repellent recipe listed above, but instead of adding vodka, add 16 ounces of almond oil. You can apply this mixture directly to your skin to repel carpenter bees and other insect pests. Several companies produce natural and herbal insect repellents, which you can find at most health food stores or organic gardening centers. Read the instruction labels on these repellents to make sure they are safe to use around carpenter bee hives and safe to use on your skin.